If anyone asks me ‘which is the best art work depicting happiness’, this is the picture I would suggest. In this picture, a family sleeps on a broken cot. Water drips from the roof but they are having a peaceful sleep. The smile on the faces shows how happiness does not have anything to do with materialistic things but rather with attitude. 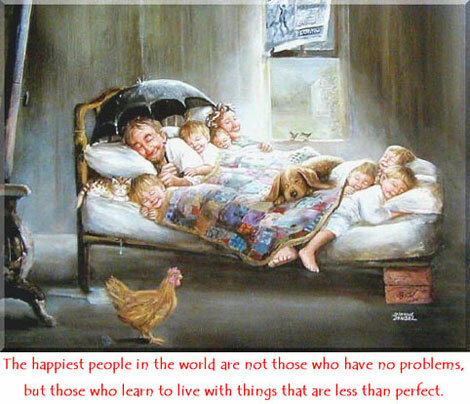 So true that the happiest people in the world are not those who do not have any problems, but those who learn to live with things that are less than perfect. I believe I can call myself happy and my friends call me happy too. I know for sure that my ultimate goal of life is happiness. Though I won’t call myself an expert on happiness by any means, I can say that in my pursuit of happiness, I have learnt few things. I have learnt things that make us happy and things that do not make us happy at all. I have also learnt about the things that claim to make us happy but they do not do so in the long run. 1. Healthy Relationships: Not only that I over emphasize on close, healthy relationships, it has been scientifically proven that healthy relationships are key to one’s happiness. For happiness one must seek family and not fortune. Closer ties with people help in fostering the sense of belongingness in a person. This sense of belongingness, as demonstrated by Abraham Maslow, is one of the basic needs of a human being. And it is obvious that when a need is fulfilled, it gives happiness. Having good relationships give us a confidence that yes, we are loved. I derive my highest sense of happiness from the loving relationships that I am surrounded with. 2. Gratitude: It is important that we feel grateful for things and people we are blessed with. Being grateful not only helps us in acknowledging the goodness that we have around us, it also helps us in being real with our immediate world appreciating its presence. Feeling thankful for our life as soon as we wake in the morning or writing a gratitude journal go a long way in making us happy and content. I do not make a list of things or people I am thankful but this is so because I genuinely thank God in my heart each day. I make efforts to keep in touch with people who are my well-wishers. This is my way of feeling grateful for their presence. 3. Happy People Around: We often under estimate the power of company. We seldom realize that being in the company of happy people rubs off some effect on us too. I have it proven in my life that when I spend more time with people who complain, I develop a tendency of complaining as well while when I spend time with friends who love to laugh, I begin to smile often. A company of happy people makes us happy. Period. 4. Helping Others: There isn’t a single person who feels sad after helping somebody or after giving back to the society in some form. We get a sense of long lasting happiness when we give it back to the society as a whole or to an individual. I feel a sense of immense satisfaction and a boost in self esteem when I go out of my way to help somebody. My life is made us of these small, little gestures that have now shaped me into a happy woman. 5. Some ‘Alone-Me’ Time: We often fail to understand the tremendous power of ‘me’ time. I am an extrovert and I thoroughly enjoy the company of people but having said that, I know that I need my dose of ‘me’ time in a day, come what may. Even after a long night party, I stand over in my balcony staring at the dark, blue sky and having a deep conversation with myself. This ‘alone-me’ time is essential for everybody’s emotional and mental well being. This well being then lays a foundation of long term happiness which is built on the connection a person develops with his one-self. Just the way we know a set of things that make us happy, my journey of life in the last 34 years (yes, I am 34 years old!) have taught me the things that do not make us happy at all. These things, marked in RED, bring misery to us and make us unhappy, sad and frustrated. 1. Health Problems: This is probably the biggest cause of a person’s constant worry and unhappiness. Bad health cripples our daily life and becomes a hurdle in our day-to-day functioning. This not only affects our self confidence and normalcy of life, this also leads to lasting unhappiness. The physical pain or the emotional agony of not being able to function like others leads to deep sorrow. Our health should be our first priority but sadly we realize it only when we lose a bit of it. 2. Unhealthy Relationships: Just the way healthy relationships lead to long term happiness, unhealthy relationships can be devastating. Not just an unhappy marriage can get deadly for a person, being in the company of unhappy people can also bog us down in life. I recently had to let go of a dear friend from college because she had begun to become toxic in my life and I could feel it. Each time I talked to her, my mind would only become over stressed. 3. Pursuit of Materialistic Pleasures: In my humble opinion, pursuit of materialistic pleasures has an inversely proportional relationships with happiness. Not a surprise that a recent study found how Facebook can make us unhappy and have detrimental effects on our mental health. Running behind money does not take us in a better direction either. Rich people are not happy and this sheds light on the fact that money may bring us pleasures but not happiness. I agree, sometimes we equate happiness with the materialistic pleasure we have accumulated in our lives – car, big house, foreign trips etc but trust me, the real happiness – the one that lingers on for long – comes from within and not from these materials located outside our body. 4. A Wandering Mind: I believe this is the biggest cause of my misery. I am somebody who finds pleasures in small, little things but my main problem is my wandering mind. I am content with what I have but I still sulk at times and that is mainly because my mind has a habit of wandering. I often go into wild thoughts of running away from everything. While this unnecessary wandering has reduced over the last few years but I still have difficulty in focusing my mind on one, single thing and this has caused me enough distress. Wandering mind leads to distractions. It takes our attention away from the present to something far off, distant. It takes us away from reality and fixes itself up on an illusion and this results in ultra dissatisfaction from life. 5. Constant Worrying (and Pessimism): In my opinion, constant worrying about something or the other is the silent murderer of happiness and contentment. I often meet people who always have a problem ready in front of them and this problem is most of the times created by their own thoughts. Initially I used to spend time with them dealing with their ‘assumed’ problems but now I saw good bye as soon as they mention their new worry. This kind of worrying dwells upon negative thoughts and fosters itself on killing optimism and developing the habit of being critical of almost everything. Research has proved that the way we think of future has a direct link with depression and hence determines our level of happiness. The more worried, critical and pessimist we are about the future, the more difficult being happiness becomes. Now that we have a set of things that make us happy and a set of things that do not make us happy, we must spend some time in thinking about things that claim to make us happy and they do so in short run but in the long run they prove to be disastrous. The following five things, marked in YELLOW, come with risk and hence should be practiced with caution as they have a risk attached with them. 1. Procrastination: We all get an immediate sense of relief when we procrastinate and probably this is why we procrastinate as well. But I do not think I need to cite a scientific study here as we all know how deadly this temporary phenomenon can get if we make it a habit. Procrastination leads to delaying of things and this eventually leads to no lessons learnt from making mistakes and this is downright harmful. 2. Consumerism: I think I can very well explain this one because I have lived a life that survived on consumerism. During my job in the IT, I spent almost every weekend in the malls – eating the outside junk food and buying clothes that I didn’t need. It seemed like a happy life to me in those days but now when I look back I regret all this ‘retail therapy’ as outright waste of money and putting on excess weight on body. Capitalist societies have thrusted the idea of excessive buying of things and hoarding them in our houses but in reality, this kind of behavior is making people sad and depressed. I am so glad we have quit watching TV over the last year. This has saved us from watching those repetitive advertisements over and over again and inducing an urge to buy things. Studies have proved that materialistic consumerism leads to depression in the long run even though it gives a momentary sense of happiness and pleasure. 3. Social Media: When Facebook was launched, everyone in a way got hooked on to it. People talked, made friends and even dated on Facebook. But leave Facebook aside, this social media that makes us feel good about ourselves when we brag about our life online, is actually highly injurious to our self confidence, over all well being and emotional health. Social media is a good cause of misery. 4. Sugar: It isn’t without any reason that people who love sugar and desserts become addicted to it. I know that I have a strong sweet tooth. Even though I realize how harmful sugar can be for my skin and over all heath, I find it extremely difficult to quit it. Sugar in unarguably addictive and any kind of addiction is not good for health. There was a time when I would reach out for a pack of cookies right after having an argument or a sad episode in life. I have been able to control my urges to a great extent now but this behavior shows what kind of effect sugar can have on our mind – giving pleasure for a short while but making us addicted to it in the long run. 5. Escaping Problems: Have a problem overhead? Duck it. This was my philosophy until some years ago. It is only recently that I learnt how escaping can lead to problems in the long run. When we escape an issue instead of facing it, it helps us in getting rid of the problem immediately but it does not give us any lessons. It does not resolve the core of the issue and it does not fight with the problem head-on. I agree we do not have to fight for every small issue, especially in relationships, but the tendency of running away from problems may seem to be the best thing to do at the moment but after a while, it becomes a habit and it is then that it hits us back and hard. Happiness is a journey. It is a state of mind. We can learn to be happy in adversity but at the same times, following the above said rules can help us in leading a better and meaningful life that can sustain happiness. If you find this article helpful, please share it and let’s spread happiness around. Happiness is a belief which is erected on Steady and Strong Foundation of mindset.One need not have all wordly pleasures to be happy…a Beggar in rugs can be much happier than a billionaire.. Stealing this picture from your blog …Reminds me of a priceless moment in my life .. Hope you forgive me for this theft. Okay. Not a problem.. but I need a favor in return. You gotta 'Like' my blog on FB! Very nice blog (as always)… Looks like the essence of life. !! I feel, For being happy, we need to think of all the good things happened to us in the past. Live in the present. Always hope for a wonderful future. Yeah. Happiness, I believe and like you said, lies in the present. It is not to be found in the past or the future. Thank you for writing. How have you been? How is your college? Thank you. I am good.. College is good so far.. Will write you an email. The Picture 🙂 Speaks More Than Thousand Words..! Hi Pavi.. You are so right. Thanks for writing. The first picture is my favorite too! Read few of your blogs and loved it. Just didn’t like one thing it made me ponder on a question – Is it right to leave a friend behind if their presence becomes toxic? Can we not help them ? Shireen, you have raised a good point here but the problem is that often only they can help themselves. A person’s toxicity arises from within and hence only he/she can remove it. As an other, we may bring it to their notice but sadly can’t do much about it. As far as leaving them is concerned, such toxicity rubs off on others as well. If you can help them out without becoming toxic yourself – very good. But if not, then it is better to walk away. Yes you are right. Sometimes toxic friends are not ready to accept their problem even if you point them out. You can really explain things well. Thank you and God bless. Nice article, found it while surfing something else. But Surubhi you are very right.